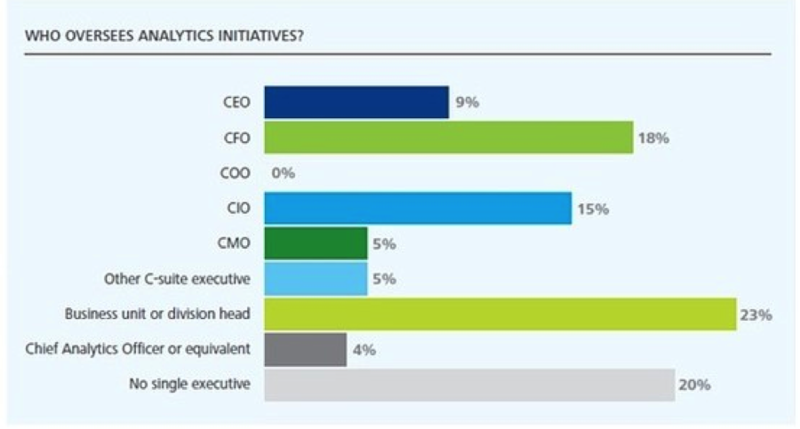 In a recent Deloitte study, “The Analytics Advantage,” executives in many different types of roles own the Big Data analytics initiatives within their enterprises, and no clear title emerges as the dominant owner (see below). Source: Deloitte Touche Tohmatsu, Ltd.
To some, this may represent general disorder associated with a new technology adoption cycle as well as the inevitable rise of the chief data officer or chief analytics officer to oversee all activities. However, that model may not work in all enterprises, and it may in fact stifle innovation when it’s most critically needed. When we meet with customers these days, we generally find a Big Data champion in a P&L manager or operations owner who is seeking to drive top- or bottom-line growth. Typically they’re focused on specific revenue or cost-cutting targets and are actively seeking the most direct path to solutions that will support or drive those initiatives. They want something that can be implemented quickly and affordably, without a huge drain on IT (a source they may not have much control over), and that delivers a quick ROI. Solutions built for owners like these typically require a new data storage and processing facility specifically for the individual use case or application, often replicating efforts being done in other parts of the organization. The rush to see the financial impact for a particular business unit or line item often comes at the expense of cohesiveness at the corporate level. Given corporate politics and the nature of this infant, rapidly changing ecosystem, many executives are taking this gamble. The result of this approach is an extremely pragmatic, but fractured environment — business units leveraging different service providers, different storage and processing technologies, and different front-end visualization tools. In more extreme examples, we’ve seen organizations with multiple teams contracting with different vendors within the same business units to solve similar problems (think customer attrition and next best offer), creating a nightmare for systems administrators who have to support multiple solutions concurrently and customer-facing organizations getting competing insights from the different solutions. However, if managed within reason, this approach does lead to short-term value in individual business units and enables the fostering of innovation within the enterprise. Indeed, with multiple approaches at play within the organization, it is certainly possible that the cream will rise to the top, and the best vendor mix will show itself through early results within a specific business. Given the nature of the market today, this is generally the widest held approach, but it’s also the most chaotic if not organized by some underlying framework. On the other side of the coin is centralization. An awful lot of chief data officers and chief analytics officers are popping up nowadays, and their goal is to identify the core technologies, partners, and use cases that the organization will focus on. These executives are often entering from the BI universe and have standardized frameworks to make decisions on storage, processing, service, and front-end application environments. Often these executives will begin their tenure by analyzing all activities currently in place at the organization and endure many dog-and-pony shows with vendors galore showing up to share their wares and produce POCs. As you can imagine, months, quarters, or even years can go by as these large assessments are taking place. Ultimately, the organization selects its “analytics stack” and pushes to make it available to the business heads. This will often lead to internal strife, as the business owners have undoubtedly begun their own independent search for analytics support and are now being forced into a specific framework — worse yet if the organization did not select a flexible stack that enables more complex applications, such as those requiring significant real-time processing. We’ve seen this process unfold at several organizations with mixed results. The key differentiator is analytical maturity. For organizations that have legacy analytics talent focused on next-generation BI applications, we find factions of dissent that make this centralization process fairly painful to implement; each business unit and technology leader has a different view on the right stack and often has taken steps in that direction. For organizations in the early stages of their analytics journey and with fewer stakeholders with prior biases, defining the analytics stack corporation-wide actually helps set the stage for productive analytics deployments. Luckily, enterprises can find a happy medium. By combining the best of both concepts, namely enabling the flexibility required to stay innovative while ensuring basic compliance and coordination, enterprises can stay ahead of the curve and enable the right technologies in the right contexts. This starts with an open-minded central leader, often the CTO or CIO, who can set guiding principles for decision making on Big Data analytics efforts across the enterprise. These principles should include compliance, governance, and industry best practices but be kept intentionally broad, so key stakeholders can align within them with relative ease. Once the principles are in place and new efforts begin to be deployed, an independent assessment via the CTO or CIO’s organization can identify additional findings and best practices that can be shared within the organization. A flexible “analytics stack” can be suggested at this juncture as well. With projects underway across the organization, remaining in compliance with corporate principles and the suggested analytics stack, consolidating platforms and collaborating multiple analytics teams and efforts can be managed in an organized fashion. In addition, enterprises can begin phasing out legacy solutions that are no longer optimal at this juncture. There is no perfect, easy, or seamless way to overhaul a company’s Big Data analytics approach. But we can say with a fair amount of certainty that it works best when a corporate c-level executive is able and willing to set company-wide guidelines and then allow the people closer to the issues at hand to have the control and input they need to attain their goals.